This cemetery was recorded in April 2011. Thanks to GPGS volunteers Carol Franklin, Howard McCalla, Ben Grimes, Rena Yarich, Lynn Shumaker and Regina Shumaker. The recording was done by sections. There are 8 sections. Sections were recorded in rows beginning in the northwest corner of each section. Rows were numbered west to east in each section. Spaces numbered north to south in each row with an allowance being made for spaces between stones for either empty or unmarked graves. See the picture of an aerial view with the sections identified. 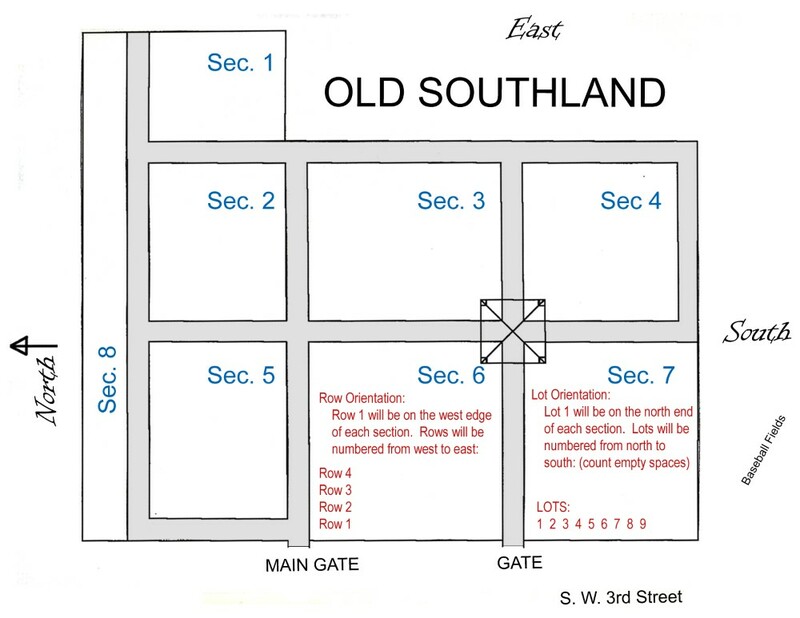 Note: Southland Cemetery is surrounded on the north and east by Southland Memorial Park. They are two distinct cemeteries and maintained by different people. Click on a photograph and it will enlarge in a new window for better viewing. 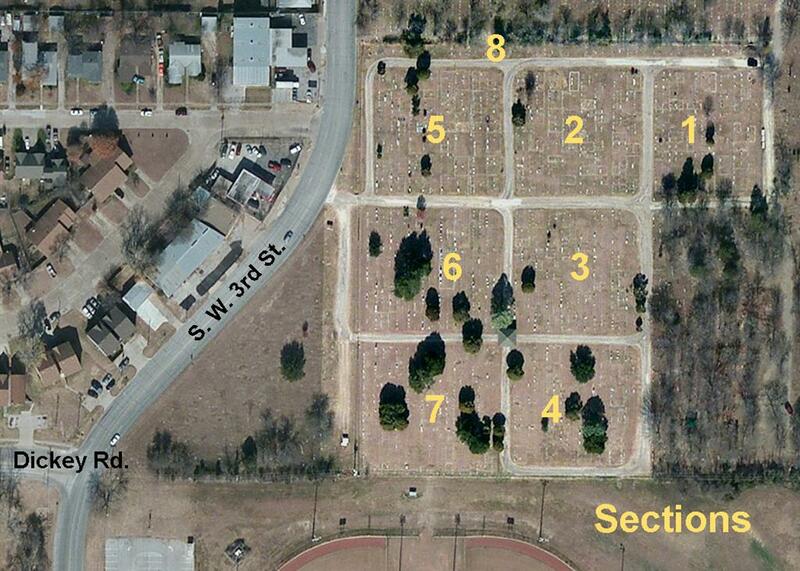 The cemetery is located in the 1200 block of Southwest 3rd Street in Grand Prairie, Texas. (Old) Southland Cemetery Association, Inc. is now classed as a non-profit, incorporated group. In October 15, 1974, it came under perpetual care status, when two of the trustees, Dewey Millar and Mrs. Edmmond (Lura) Keith made substantial contributions to develop the trust. The cemetery was developed under the guidance of Bob Motley and Thomas H. Hall (his father-in-law) as the existing cemeteries (Watson and Fugate) were located approximately four or five miles from original townsite. There are many of the early 1900, standing type markers in the cemetery. The grave of Edward Z. Motley (son of R.P. and S. E. Motley, born 11 September 1885, died 11 March 1910) was the first in the original plat. Another old grave is that of G. B. Hall (born 27 March 1878, died 9 November 1910). There are two graves with markers showing a death earlier than 1910. They were removed from other cemeteries and re-interred at Southland. Thomas E. Vernoy (one of the original Peter’s Colony – Dechman early settlers) whose original farmsite was located near the cemetery, but moved to another farm located on Ridgewood Drive off of Racquet Club Drive near Corn Valley Road in south Grand Prairie. Even though there is a cemetery here bearing his family name, his relatives relocated his remains and those of Julia A. Vernoy to Southland. (Note: Originally his name was spelled Vernooy on the first tombstone that lies horizontally on the grave.). Mrs. Fannie Millar Sadley and infant daughter (1876 – 1909), aunt of the cemetery president was reinterred from the old Fugate Cemetery in 1910. In 1918, “Grandma” Emma Motley donated the distinctive and impressive arch at the entrance gate of the original portion of the cemetery. There are very few empty spaces left in this historic cemetery that are available for sale.